Tomas is the star of numerous instructional magic DVDs throughout the years. With the exception of the Penguin Magic Lecture, all the following products are proudly manufactured and distributed by FUN INCORPORATED. They’re available all over the world at just about every magic store and online dealer! After Tomas created this trick in the early 2000s, magicians from all over the world performed the effect. 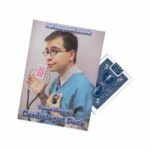 The instructional DVD is FULL of creative card revelations and humor. The deck is precision-made by the USA’s only magic trick factory, FUN Incorporated. 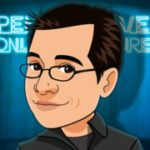 Tomas shares many of his favorite routines from working in a traveling side show. 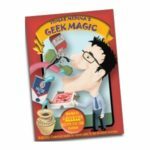 The DVD is definitely a must have for any magic enthusiast, as it’s a wonderful collection of gross-out-your-mom stunts. The DVD’s are as fun to watch as a live Tomas performance. Well, almost. This is probably the world’s best card trick. Tomas gives you several methods to performing this classic routine. The DVD is not only very informative, but in classic Tomas fashion, they’re entertaining to watch. The card moves, psychology, and one-liners make this product a huge value. Special gaffs are included! Magic up your meals! M-U-M Magazine reviewer Marc Desouza recommended this DVD as worthwhile viewing for any magician. 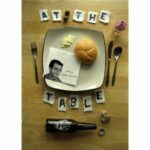 These are all clever routines to perform with items found at the dinner table. From sugar packets to napkins to toothpicks, all these routines are easy-to-master and deliciously fun! One of the most popular close-up magic tricks of all time. Matrix is a trick that can be performed with borrowed objects – pocket change, keys, you name it – at a moment’s notice. Take the time to learn it, perfect it, and perform it. A GREAT value, and always a hit! 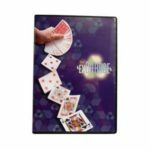 A must-have resource for every magician, This DVD is an Encyclopedia Britannica of the most essential card moves in history. 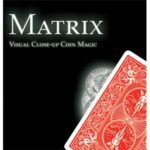 Once mastered, these techniques will serve you throughout your career as a magician, providing you a solid foundation on which to build an endless repertoire of magical effects. This DVD is adored by magic nerds around the world. Like a Best Of record, this is a treasure trove of some of the best rope routines ever devised. This DVD teaches a host of miracles that can be performed with an ordinary length of rope. Best of all, no complicated sleight of hand is required! After watching this DVD, you’ll be able to make magic with rope just about any time and anywhere. Created by David Goring and routine by Tomas. Once you witness the Exchange in action, you’ll swear that either a supernatural force has possessed a deck of cards or you’ve witnessed a bona-fide blip in the fabric of reality. Comes complete with a DVD FULL of wonderful card moves, handling, and (of course!) odd-ball humor. Gimmick included. The next best thing to hanging out with Tomas in person, this DVD captures him live in action. Included is a sampler of many routines Tomas uses on a daily basis. From cards, to coins, to ropes, to tricks with breath mints, Tomas thoroughly entertains. Highly recommended for those looking to take their magic to a more professional level. 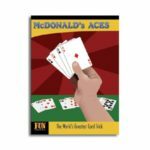 Have you ever wanted to produce a deck of cards any time in your act? One moment, your hands are empty. The next – WHAMMO! – you’re holding a deck of cards. Now you can! 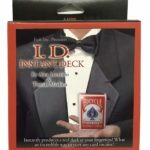 The secret device that makes it possible is called The ID – The Instant Deck. This perfect opening trick is easy to do and produces boxed or loose cards, as well as other items too: wallets, phones, GPS systems, and much more! Switch decks seamlessly while performing close-up or on stage. Over two years in the making, The ID is a precision device, factory made in the USA. Each one is supplied with DVD instructions featuring creators Tomas Medina and Alex Lourido teaching dozens of tips, handlings, and tactics that will make The ID a favorite in your act.